This page of kangaroo facts has a lot of information. It provides an overview and summary. Kangaroo Facts - What's In A Name? The word kangaroo stems from an Aboriginal language (Guugu Yimidhirr). The Aboriginal word gangurru described the Grey Kangaroo. The name kangaroo is used broadly to include all species within the super-family of macropods. The Macropodidae include kangaroos, wallabies, wallaroos, pademelons, tree kangaroos and forest wallabies. The Potoroidae include rat kangaroos, potoroos and bettongs. "Roos" is a colloquial name used for any kangaroos or wallabies. Most people think kangaroos are endemic to (live only in) Australia. 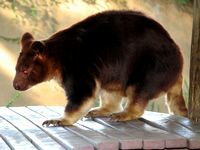 In fact, several species of tree kangaroos and forest wallabies also live in Papua New Guinea. 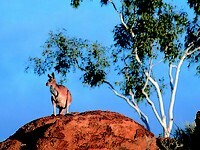 Red Kangaroos are adapted to the big open plains covering the dry interior. 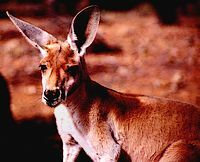 Eastern and Western Grey Kangaroos prefer moister forests and scrublands of eastern, southern and south western Australia, but their habitat also overlaps with the Red Kangaroos. They're not as famous as the Red Kangaroos, but are the most commonly seen species in Australia. Common Wallaroos can be found throughout inland Australia. Their preferred habitat is stone country and rocky outcrops. Rock wallabies are more extreme. They live in piles of boulders, on rocky hills and even in cliff faces. Tree kangaroos are adapted to living in trees (sort of, they are still clumsy). They live in the rainforests of northern Queensland (and further north in Papua New Guinea). 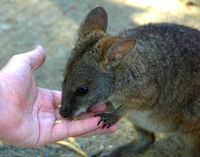 Most of the lesser known smaller species of wallabies and kangaroos are highly specialised. Some have a very narrow distribution, which makes them vulnerable to changes in the environment. Their habitats range from deserts to woodlands to rainforests... No matter where you go in Australia, there will be at least one species of kangaroo that lives in and is adapted to that area. At least six species of macropods have become extinct since Europeans arrived in Australia. Several more are endangered. Examples of extinct species: Eastern Hare-wallaby, Central Hare-wallaby (may be extinct), Crescent Nail-tail Wallaby, Broad-faced Potoroo (may be extinct). The Red Kangaroo is the largest living marsupial and can grow to two metres (!). It weighs up to 90 kg (200 pounds). Top speed: over 60 km/h (close to 40 mph). A Red Kangaroo can leap eight metres far (25 feet) and three metres (10 feet) high! The Eastern Grey grows to 1.5 - 1.8 metres and a big male can weigh over 60 kg (130 pounds). Females are much smaller than the males. Eastern Greys can jump as well as the big Reds: up to nine metres (29 feet) in one bound, and can reach speeds of nearly 50 km/h (30 mph). The Western Grey is slightly smaller and lighter (a good 50 kg or 110 ponds for a large male). The other, smaller macropods come in all shapes and sizes, some weighing as little as 500 g.
Kangaroos are the only large animals that move by hopping. The large and strong tail is used for balance when hopping, and as fifth limb when moving about on all four legs, er, five. Hopping is a fast and energy efficient method of travel, designed to cover huge distances in a land that offers little food.or water. Odd kangaroo fact: on land kangaroos can't move their hind legs independently, only together. But when they are swimming (they are good swimmers) they kick each leg independently. All kangaroos are herbivores. The grazers or browsers eat only plant matter. Kangaroo species that are adapted to the drier regions need very little water. Red Kangaroos can go without water altogether if there is fresh green grass available. The stomachs of macropods are complex sacculated organs. The compartments contain microorganisms that aid with digestion by fermentation A bit like cows... Some kangaroo species also regurgitate and chew their food like cows. Most macropods are nocturnal, moving about and looking for food at night time. Some are particularly active during the early morning or late evening hours (they are said to be crepuscular, which means active during twilight hours). Few are active during the day. Most kangaroos spend the day resting in the shade. Kangaroos live in "mobs" of about ten individuals, males and females. There is one dominant male, usually the oldest and biggest male. This male is the only one to mate with the females in the mob. Male kangaroos "box", either in play, when asserting their dominance or in serious competition over females. The punching of the front legs is pretty harmless, but the powerful hind legs with their long sharp toenails are a dangerous weapon. Kangaroos can disembowel opponents, be it other kangaroos or predators like dogs. All marsupials have a pouch in which their young live, drink milk and develop until they are big enough to face the world. The pouches of all macropods open forwards (whereas the pouches of koalas or wombats open backwards). Like all marsupials baby kangaroos are born at a very early stage of development, 31 to 36 days after gestation. If you compare that to humans it would be at the seventh week of a pregnancy. At that stage the joey is not much more than an embryo, a pink hairless tiny worm. Only the front legs are a bit developed, just enough to allow the embryo to make its way into the pouch and attach to one of the four teats. Initially the joey is permanently attached to the teat. As it grows and grows some hairs it also learns to let go and reattach itself. It takes several months until the young is covered in fur, and mature enough to leave the pouch for the first time. In Western Greys for example this takes 9 months! During the following months the joey will spend more and more time outside, exploring its surroundings. Eventually it will permanently leave the pouch. Even after the joey has "moved out" it will continue to drink milk from the pouch. Weaning takes a few more months. By the time it is fully weaned a grey kangaroo may be over 12 months old! A female kangaroo can have three babies at the same time: an older joey living outside the pouch but still drinking milk, a young one in the pouch attached to a teat, and an embryo awaiting birth. Because of this very efficient way of bringing up their young, kangaroos raise on average three young every two years, even though it takes such a long time for the joey to become independent. Most photos on this page are from Wikipedia and are under GNU Free Documentation License. Red Kangaroos, Rock Wallaby and Agile Wallaby pictures courtesy of Tourism NT ©.